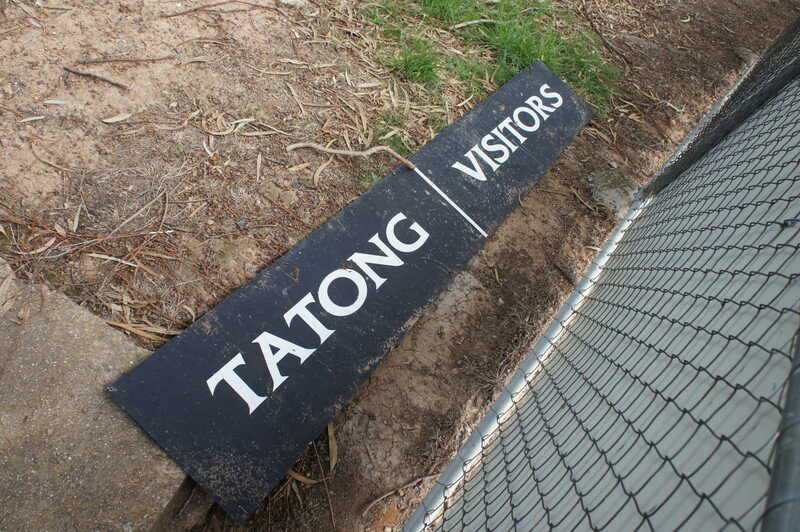 Tatong and Swanpool were on my list of grounds that I wanted to visit for a match. ‘I’ll get around to them one day’, I thought. And twelve months ago, both clubs were still playing in the Ovens and King league. 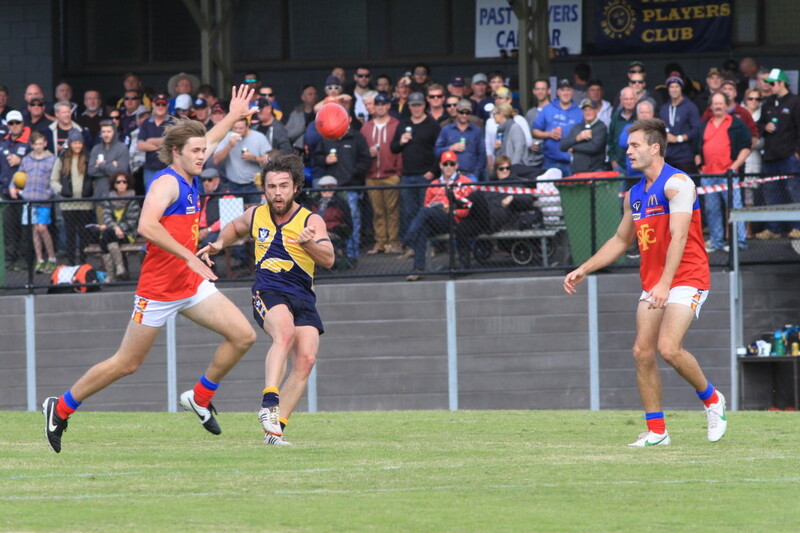 Admittedly, the two copped a lot of big defeats in 2013, in both seniors and reserves. But there is more to a country football club than winning, and each club boasted four netball sides too. Over the summer, the newish governing body of football in the area, AFL North East (hey, is the name of the game ‘AFL’ these days? Because it was Australian Rules Football last time I checked) directed Tatong and Swanpool to merge with the Goorambat club. Goorambat is over 40km away from both towns. Swanpool and Tatong weren’t interested in that kind of merger, but the two great rivals did offer to merge with each other to become more competitive on the field. The Picola league seemed open to accepting Tatong and Swanpool, either as a merged entity or as separate clubs. 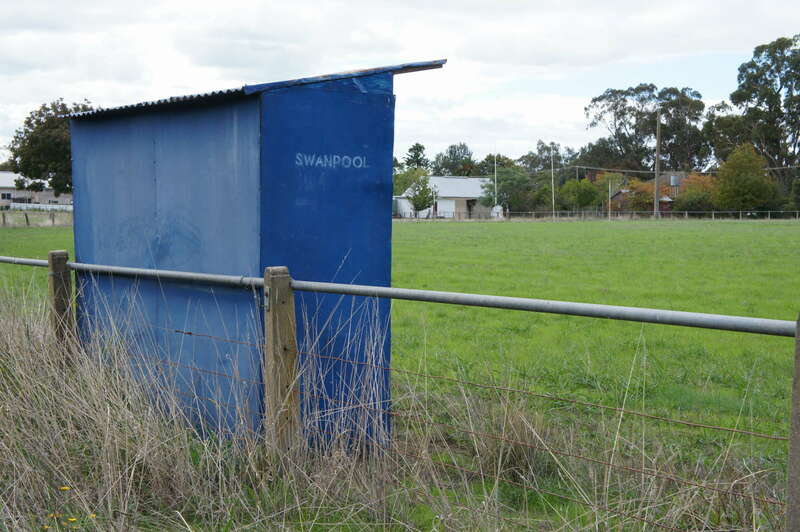 Unfortunately, AFL North East decided that the application to join the Picola league had been made too late, and Tatong and Swanpool were forced into recess for 2014. Now, I am loath to criticise the governing body, as I can only assume that it knows what it is doing. However, one would have thought that AFL North East should be doing everything it can to help struggling country football clubs to survive. 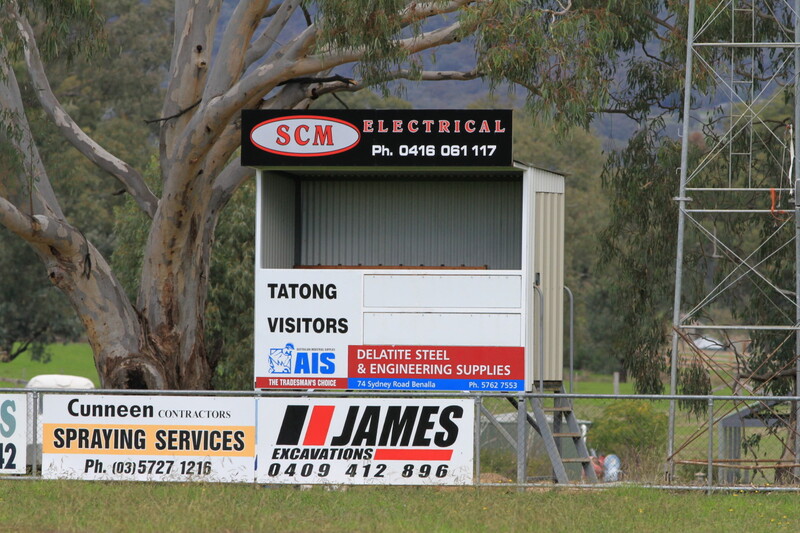 The very smart white scoreboard at Tatong. 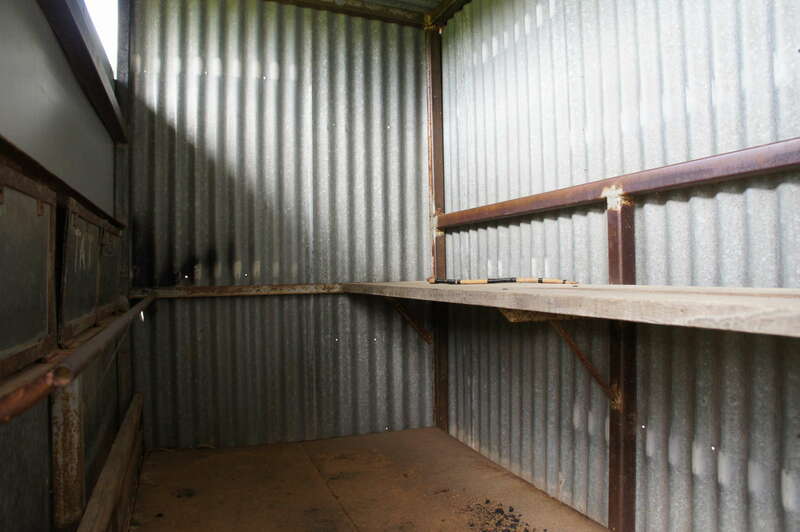 The home dressing rooms are open for the curious Scoreboardpressurer to wander through. 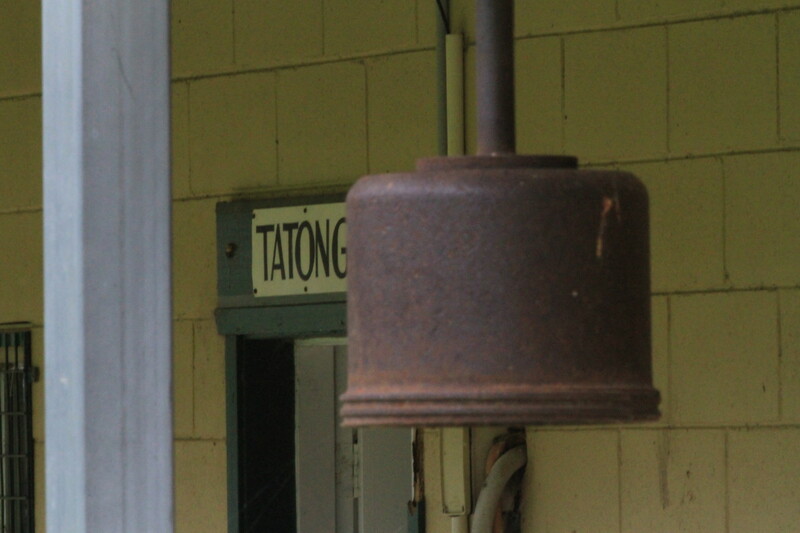 No crime or vandalism in Tatong. The old bell in front of the rooms. Was that used to signify the start and end of quarters in the old days? There was no-one around to ask, so I don’t know. The ground is beginning to get overgrown. They still play cricket there, so it won’t get too bad. 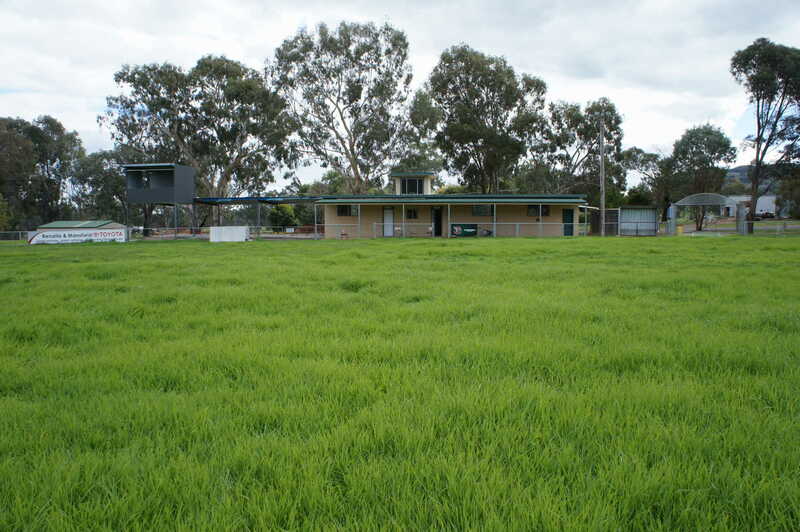 Looking down towards the social rooms at the western end of the Tatong ground. The rooms are being extended, which is a good sign. The old scoreboard, now converted to advertising, is just to the right of the new scoreboard. A mural on the back of the dressing rooms. 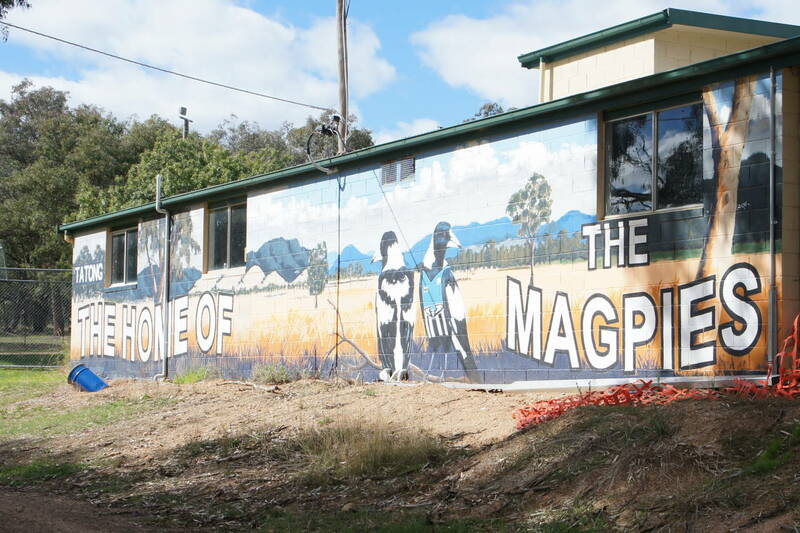 One thing is for sure – if the merged Tatong/Swanpool club does get off the ground next year, it won’t be known as the Magpies. Inside the old scoreboard at Tatong. This looks like a name plate from the old scoreboard. I wonder what it is doing there. Perhaps AFL North East was responsible. Then it was off to Swanpool for more football melancholy. Swanpool is a great little ground. I do hope that they get the new merged club going next year. 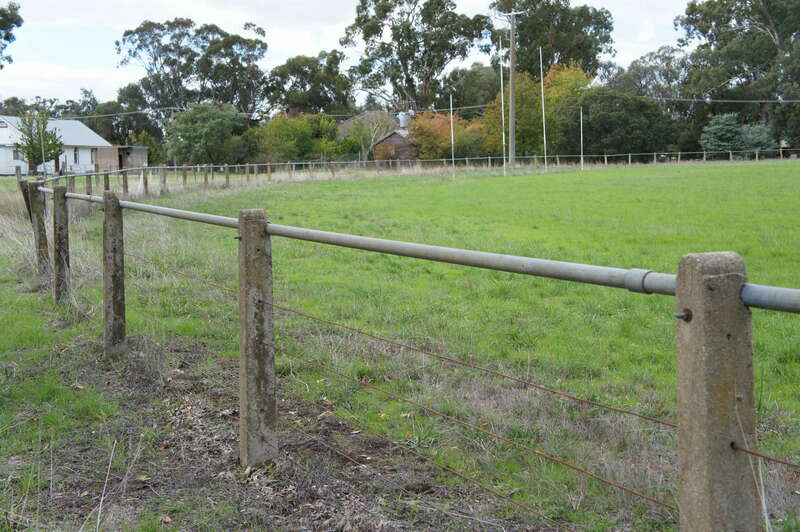 It would be a real shame to see grounds like Tatong and Swanpool lost to country footy. 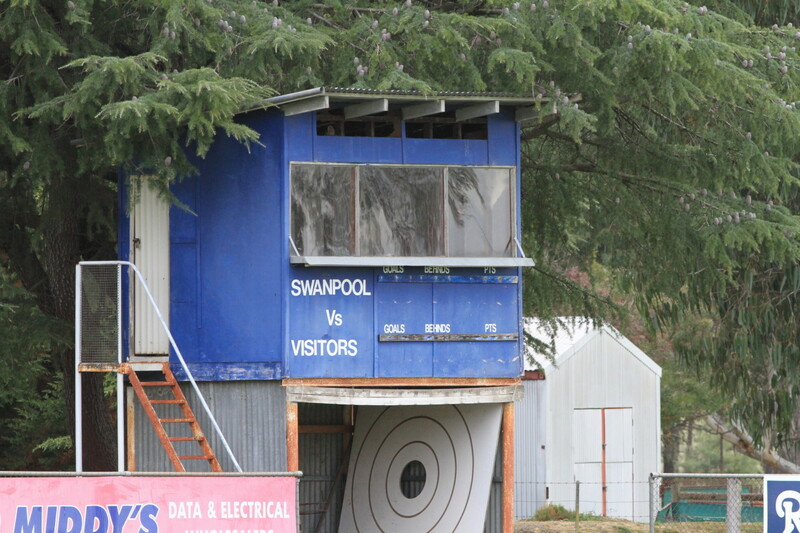 The very attractive blue Swanpool scoreboard won’t be used this season. Concrete fence posts are a novelty. The Swanpool social rooms and scoreboard. 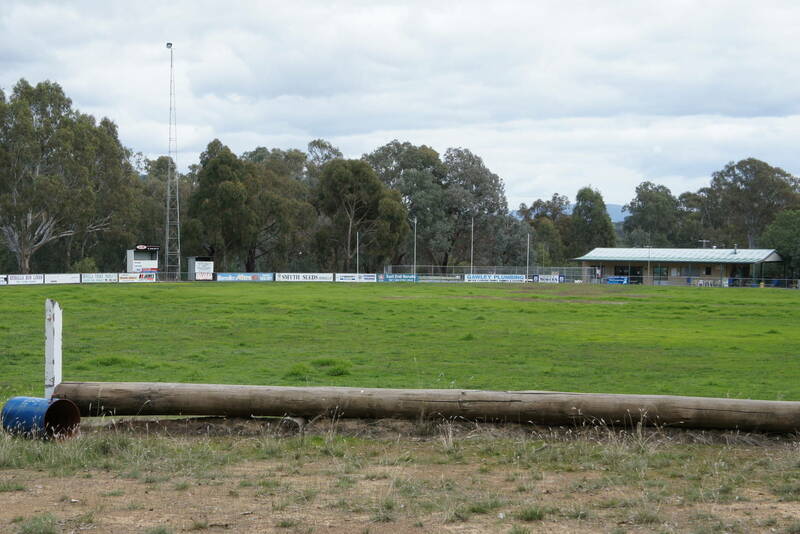 After all that gloom, it was time to head south to Mansfield for the big Easter Saturday match between Mansfield and Seymour in the Goulburn Valley FL. Here at last were two clubs that AFL North East did approve of. The big attraction here was high-flying Seymour full forward, Saad Saad, the most exciting country footballer I ever saw. Saad booted eight goals on this day, but Mansfield prevailed by six points in one of the better games of football you’d be likely to see. 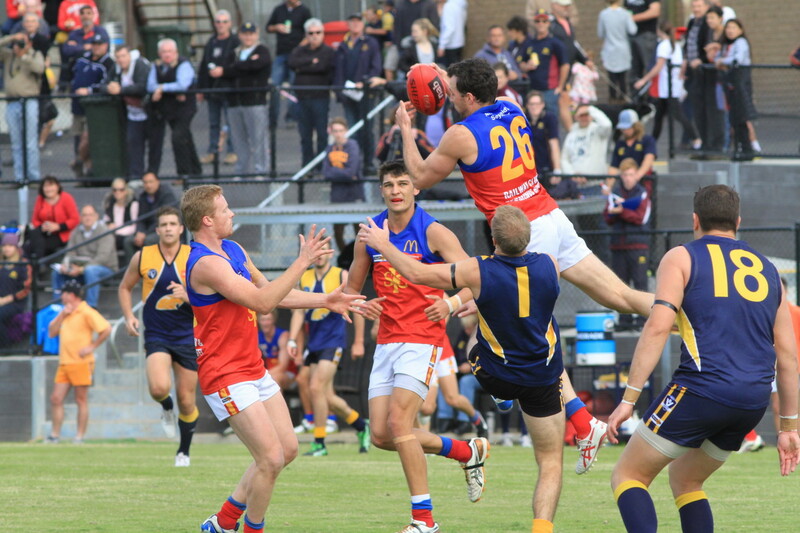 We like the Fitzroy-style Seymour jumpers. The big holiday crowd at Mansfield. Thanks for the photos Meike from Swanpool & Tatong, I was over at Benalla the other day & I took a detour to Tatong & Swanpool after I finished up at Benalla to take some photos & to see how it was looking after the VCFL dropped the hammer on them. But now I don’t have to worry about it now because you beat me to the punch. Anyway, great work it’s really appreciated. At least we got Thornton back this year. 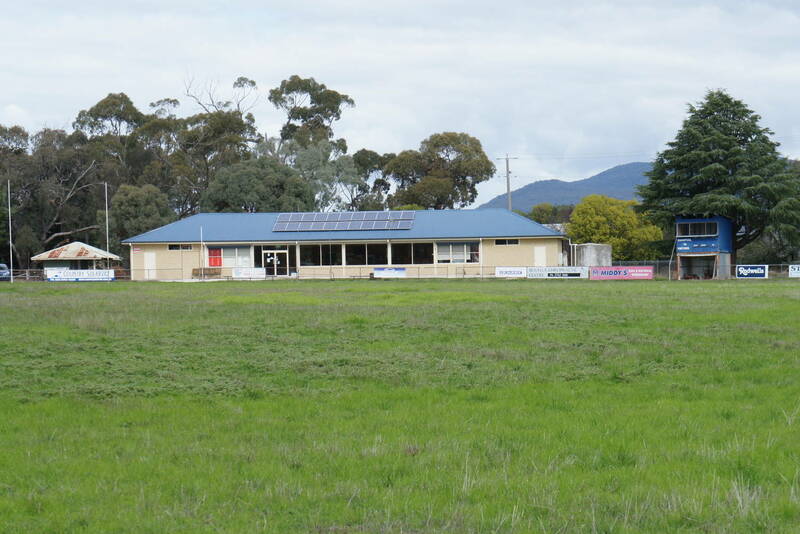 I think I’ll check out the reborn Thornton-Eildon club before too long. 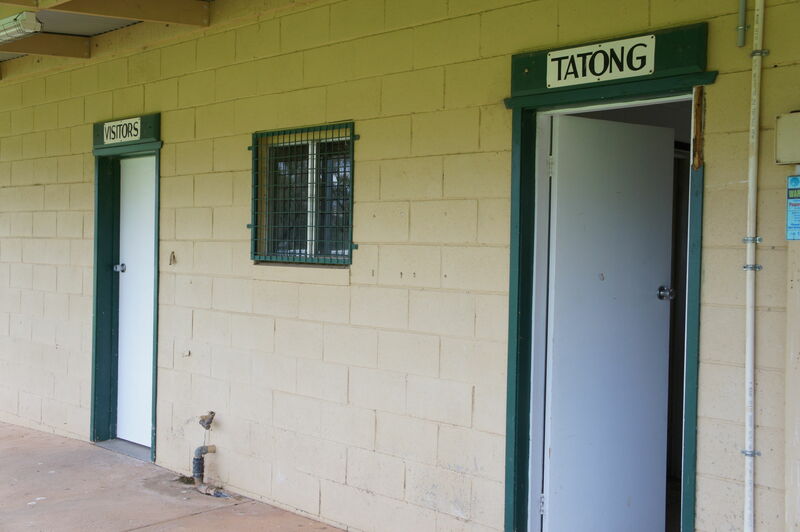 Here’s hoping the Tatong and Swampool scoreboards are back in action next year.Really like the photo of the bell, Meike. We’ll be featuring the Cressy bell (and ground) soon. Look forward to it, Vin. Good luck, Mathew. It is one of the most beautiful parts of the country up there, but it would be even better with its football club(s) back. Let’s hope that they don’t put any more obstacles in your path. 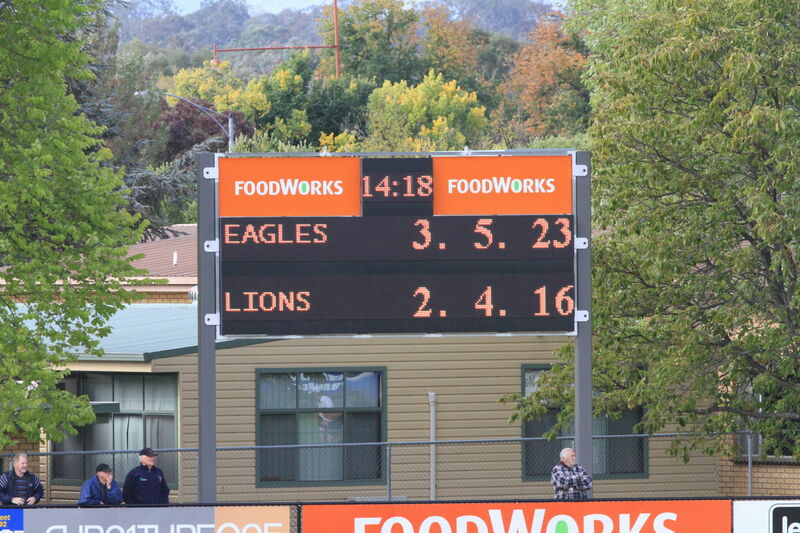 Great site and thanks for showing our new board at Ferntree Gully. Will try to get some photos of our older scoreboards. Loved a lot of the older photos.